April 14, 2017 April 14, 2017 ADMIN	16 Comments attorney Brandon Jones, Attorney Christine Johnson, Attorney Matthew Frizzo, attorney Robert Wilson, barbecue franchise, barbeque franchise, BBQ franchise, Bryan Pelt, Christine Johnson, Dickey's franchise bullying, Dickey’s, Dickey’s Barbecue Pit, Dickey’s Barbecue Pit franchise, Dickey’s Barbecue Pit franchise complaints, Dickey’s Barbecue Pit Restaurants Inc., Dickey’s churning, Dickey’s franchise, Dickey’s franchise owners, Dickey’s legal department, General Counsel Christine Johnson, Matt Frizzo, Roland Dickey Jr.
Christine Johnson, General Counsel of the Dickey’s Barbecue Pit franchise company, coordinates and orchestrates litigation against Dickey’s franchise owners. She not only oversees a formidable in-house legal department, she developed the Store Transition Program that accounts for the remarkably high number of Dickey’s franchise ownership transfers each year. So effective is Johnson’s store transition team, numerous franchise stores are transitioned through as many as three or more owners before they permanently close. 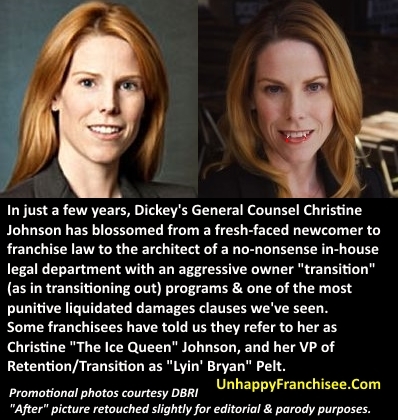 (UnhappyFranchisee.Com) Christine Johnson is the General Counsel for Dickey’s Barbecue Restaurants, Inc. (DBRI), the franchisor of Dickey’s Barbecue Pit restaurants. Christine Johnson has built up a formidable in-house legal department which currently has four attorneys on staff, including Matthew Frizzo, Brandon Jones, and Robert Wilson. Tabatha Anderson is listed as Senior Legal Assistant/Transitions at Dickey’s Barbecue Restaurants, Inc.
Jes Alexander is listed on LinkedIn as Deputy General Counsel & Compliance Counsel for DBRI since June, 2014. Christine Johnson lists the formation and oversight of the Dickey’s Store Retention/Transition Program as one of her professional achievements. That program is headed by VP Retention/Transition Bryan Pelt who oversees a staff (according to LinkedIn) that includes Scott Musch, Jonathan Stanley and others. The Dickey’s retention/transition team reportedly works with Christine Johnson’s legal team to keep franchise stores from closing and finding creative ways to motivate other franchisees and current and former franchisees to take over failing stores. Christine Johnson’s legal team also handles human resources issues that arise in the high-turnover Dickey’s corporate workforce. According to inside sources, Christine Johnson’s legal department is extremely proactive in demanding non-disclosure, non-disparagement and general releases from employees and franchisees, and makes them a requirement for almost everything from severance pay to listing a franchisee’s location for sales to receiving a one-page non-itemized category summary of the systemwide marketing fund. Attorneys who have reviewed these onerous agreements have remarked that they’ve never seen anything quite like them. Have you had dealings with Christine Johnson, Matt Frizzo, Bryan Pelt or others in the Dickey’s legal and transition teams? Please share your opinions and observations confidentially either with a comment below or by sending an email (in confidence) to UnhappyFranchisee[at]gmail.com. Both positive and negative experiences and opinions are welcome. Christine S. Johnson is General Counsel for Dickey’s Barbecue Restaurants, Inc., headquartered in Dallas, Texas. Among other responsibilities, Christine manages all aspects of litigation brought by and against Dickey’s. She also guides Dickey’s through franchise registration, franchise sales and offer compliance, agreement negotiations, and counsels the company on franchisee relationship matters. Prior to taking a position with Dickey’s Barbecue, Christine was a Senior Associate with the law firm of Fletcher Farley Shipman and Salinas, LLP where she focused her practice on insurance and corporate defense litigation. Responsible for oversight and management of the Legal and Retention Departments for rapidly expanding restaurant franchisor. Prepare and maintain departmental budgets, conduct monthly evaluations with personnel, and ensure operational efficiency within the department. Provide counsel and guidance to the board of directors, CEO, and executive committee on a broad range of issues including: business strategy; litigation strategy; employment matters; franchise regulatory compliance; commercial transactions and disputes; and internal policies and procedures. Hire and manage outside counsel in litigation brought by and against the company in federal and state courts. Formulate litigation strategies, review billing, and prepare budgets. Review, prepare, and negotiate a variety of commercial contracts to support the business needs of all departments. Responsible for drafting and filing annual renewal, and any required amendments, of the Franchise Disclosure Document in compliance federal and state regulations. Decreased the average turn-around time for legal requests and projects by managing assignments and adjusting staff workload. ARE YOU A DICKEY’S FRANCHISE OWNER OR EMPLOYEE? HAVE YOU BEEN TREATED FAIRLY BY CHRISTINE JOUNSON, MATTHEW FRIZZO & THE DICKEY’S LEGAL DEPARTMENT? Christine and Bryan are both pathological liars. Don’t believe anything you hear from either of them. So I got food poisoning from their bbq at the corp office. So did 5 others. Currently being tested by the FDA for e.coli. Heres my resignation/cease and desist letter that is completely infactual. Jeff Gruber deserves some attention as the constant top facilitator and coordinator of the Dickey’s System. I’m considering purchasing an existing Dickeys franchise. I’ve been reading the negative comments about franchisee experiences. I now have concerns. Please help me understand your experiences and why I should or should not get involved with a Dickeys franchise. Do not get involved, I repeat DO NOT. Run, as fast as you can, and thank every single person that told you to run. DBRI is a failing company. The existing franchise is selling because it is a failure model. The business model in general is a failure. It’s a pyramid scheme that trickles to the top. Every single cent you spend on anything from food to equipment is a cent Dickeys puts in their pocket. Buy some buns from Sysco? Oh, don’t worry Roland is getting a cut of that from their “package” mark up. Buy sausage? Don’t worry Roland is getting three cuts of that. His shell company that sells the product to the distributor, then the mark up from the distributor then the royalties you pay from the consumer. Buying some equipment? Yep they get a percent of that too. Uniforms? Same. Whatever you are doing now for work, even if you work at mcdonalds flipping burgers is better then owning a Dickeys. They take 9% from you between royalties and marketing but they act like they own you 100%. They will tell you what to do, when to do it and how to do it. If you fail? They will threaten to sue you for hundreds of thousands of dollars. Mainly the hag that this thread is about. Sometimes they will attempt to sue you for that much, but it’s really just to waste your time and money and to break you as a human. You will lose your house, your cars, your life savings becahse of these people and your self respect. Then they will give your store away to the next schmuck that has a dollar in his pocket. You will probably end up owing money to the state because you can’t pay sales tax. That? Will haunt you for the rest of your life. You could get that store for free and still fail. Run fast as fast as you can. I promise you will thank me later. We had three stores. The third one we were paid $8k to take it off the owners hands. At that time we were doing great. And now 14 months later we have lost everything too. I can only agree with the previous poster. Dickey’s will ruin you big time. There are not only royalty fees but a whole lot more fees for tech, online ordering, soon to have Dickey’s own POS and so on. 9% isn’t the max you pay them, no it is by far more. And another thing don’t ever believe when you get sales reports and other numbers and figures from Dickey’s. I have seen that the most are marked up by a great deal. Russ – Do not doubt anything you have read on this website. Do not be psychologically manipulated. The first stage is the Howdy, welcome to our Family! part. Nothing is real. It is a movie set. It is scripted and staged like the movie The Sting. Maybe you are a Texan. Maybe you ate at Dickeys as a kid. You love the brisket or pulled pork? Whatever it is, you must resist the attraction. It is not real. There is a 30% margin on sales…. collected by Dickeys. No profit for you the Franchisee. Yes, on top of the 9% the fees, Dickeys will milk another 20%+ out of you through the markups, fees, program requirements and lack of services that you will wind up paying for yourself to try and make the business work. Do not – UNDER ANY CIRCUMSTANCES – franchise with Dickeys. If that isn’t clear then read it 5000 more times until it sinks in. They are not in the restaurant business. Dickeys is in the franchise selling and litigation businesses. You will lose every penny invested plus your sanity. Think about what they do. You sign a franchise agreement that includes a clause for liquidated damages after you close. Approximately 75% of the stores fail within two years. No big deal for Dickeys. They just sue you for royalties and sell your store to another guy. Then they sue him. Roland figured out years ago that his path to fortune was through the legal process and not royalties. The scheme is a legal way for you to transfer wealth from your family to the Dickey family. Roland KNOWS you will fail when you sign the agreement. He also knows he’ll profit because of the agreement. How he sleeps at night is a mystery. Be thankful you have a couple of folks who have been down the road you are considering. It is literally a prison sentence to be in business with them. Thanks all for the info. This info has been enlightening to say the least. Another example of DBRI undercutting the franchisee by distributing Dickeys sausage in a local supermarket in the same shopping center as the Dickey’s franchisee. DBRI mandating that the franchisee buy the sausage from Sysco at an inflated price higher than it is selling in the supermarket. There goes the profit to the franchisee and the protected territory. Like Russ, I considered buying a Dickeys a few years back. I live in an area without BBQ and thought this would be great. I read the reviews on here and spoke to many owners and despite my desire to be in the BBQ business, common sense told me to stay away. Who needs this headache? Holy cow! I am sure as glad that I ran from this franchise after reading the negative press! Heck, I would be better off setting up my own hotdog shack and selling hot links out of a barn than this ripoff. They are sick individuals that will not stop until they ruin you. If you stand up to them, especially Roland or Christine they will stop at no end to break you down. Run far away from anything that is associated with Joe Amodio, and anything he is associated with. He was a representative for the Tilted Kilt, which many stores are shutting their doors at an alarming rate. They do not do any proper analysis on where a building should be. Everybody is losing.